Atom-optical lattice systems offer a clean, well-controlled way to study the manipulation and movement of spins because researchers can create particle configurations analogous to crystalline order in materials. PFC supported theorists have been developing a model for what happens when ultracold atomic spins are trapped in an optical lattice structure with a “double-valley” feature. This new theory result, recently published in the multidisciplinary journal Nature Communications, opens up a path for generating the spin Hall effect, an important example of spin-transport. In this system, the resulting lowest energy configuration is independent of the type of double-valley lattice geometry, indicating a type of universal behavior. With this in mind, the theorists examine a number of lattice structures where this phenomenon might be realized. For instance, if the fluid is placed into a hexagonal lattice configuration, similar to the structure of graphene, they expect the characteristic spin currents of the spin Hall effect to emerge, as depicted in the graphic. 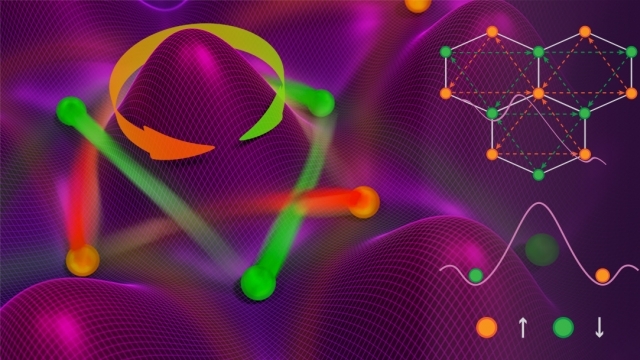 In the publication, the team points out that optical lattice systems are a flexible, pristine platform for examining the effect of tiny variations in quantum fluctuations, which are often masked in real materials. Outside of exploring novel forms of matter like the one found here, research into spin and atom manipulation has applications in emerging electronic-like technologies, such as spintronics, valleytronics and atomtronics.